On Monday, April 28th, 16 students from across Belize District competed in the hopes of representing not only their school, but the entire Belize District, at the 20th National Coca Cola Spelling Bee. In the end that honor went to Raymond Silva and Elias Zetina. Zetina is a proud student of New Horizon Seventh Day Adventist School here in San Pedro Town. The competition saw some truly amazing spellers from 15 different primary schools. 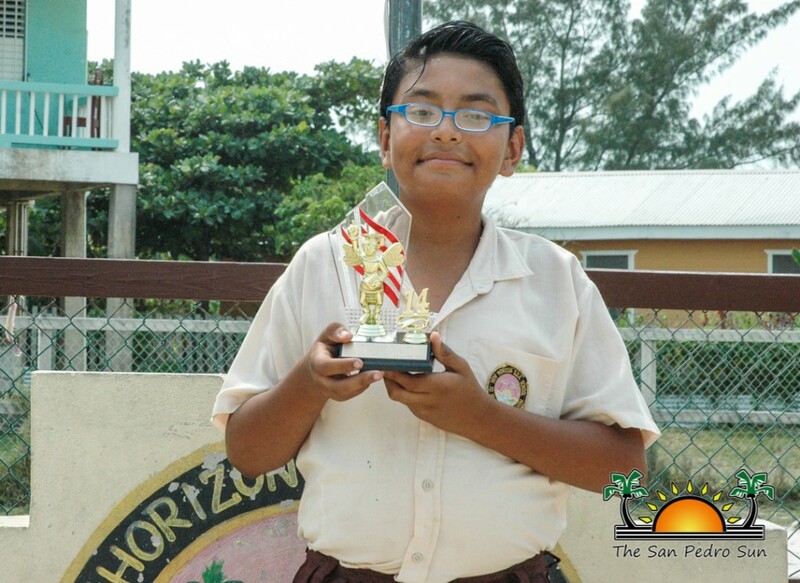 Contestants in the Belize District Elimination included Jann Burn from Pancotto Primary School. Britney Longsworth from Crooked Tree Government Primary School, Dawnille Godoy from Zion Park Methodist Primary School, Lori Herrera from Our Lady of Lourdes Roman Catholic Primary School, Ruben Hernandez and Steven Hernandez from Hattieville Seventh Day Adventist Primary School, Raymondo Silva from St. Joseph Roman Catholic Primary School, Jonathan Smith from Hummingbird Elementary, Cathrina Williams from St. John Vianney Roman Catholic Primary School, Clinto Edwards from St. Ignatius Roman Catholic Primary School, Amira Arnold from Ebenezer Methodist Primary School, Amberley Marin from Belize Elementary, Jawaan Miranda from St. Luke Methodist Primary School, Monifah Vernon from Queen’s Square Anglican School, Jannelie Mas from Caye Caulker Roman Catholic Primary School and Elias Zetina from New Horizon Seventh Day Adventist Primary School. The tough competition went as far as the third reserved list to determine the first and second place winners. In the end the coveted first place prize went to Raymond Silva from St. Joseph Roman Catholic Primary School, while second place went to Elias Zetina from New Horizon Seventh Day Adventist Primary. “I am so happy that I placed in this competition, not only for myself but for my school and my mom because they have supported me all this time,” said Zetina. Congratulations to all participants for a job well done. The San Pedro Sun wishes the two top spellers of the Belize District all the best as they prepare for the National Competition.